Today is an important day–it’s my birthday! What, did you think I was going to talk about Election Day? I think we’ve all talked about Mitt and Barack for long enough. It’s time to celebrate the fact that I am one year older. Luckily for me, I get the day off from work for my birthday! (Or for Election Day, which happens to also be my birthday). Unfortunately for me, my husband is away on a work trip for my birthday. We did early voting to make sure our votes would count, and we celebrated my birthday early, too! In fact, my husband surprised me with a fantastic day on Saturday. Look at this! 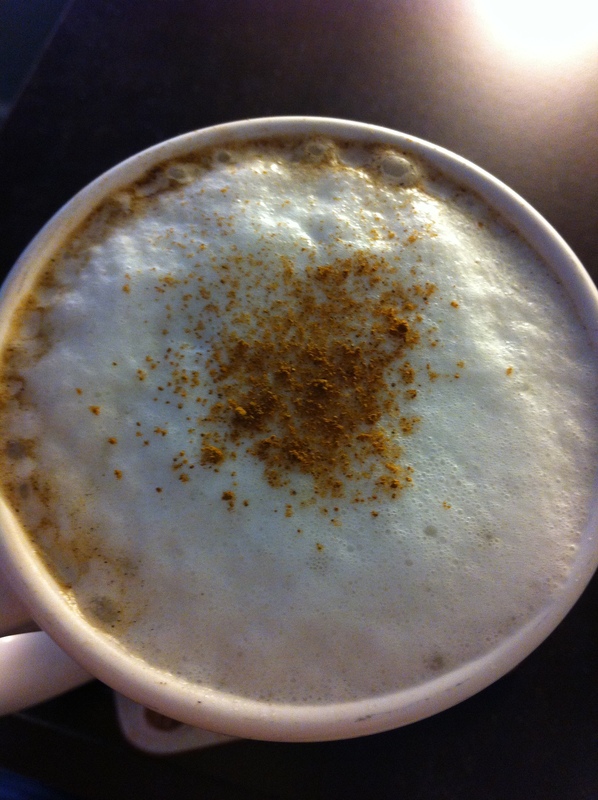 This is coffee with foamed almond milk on the top with a sprinkle of cinnamon. Did you know that almond milk could be frothed like this? We just have a little $5 whipper from IKEA and it did all this! I was so impressed that I couldn’t even drink it at first! I just took pictures and smelled it. Then I got over it, stirred it up and enjoyed the next 10 minutes of sipping delicious hot coffee while still in bed. This was a level of pleasure I had never really experienced. I don’t think I have ever been so pampered to have my husband making me special coffee and breakfast in bed. I couldn’t stop smiling! The next level of pampering came when my full breakfast was delivered. 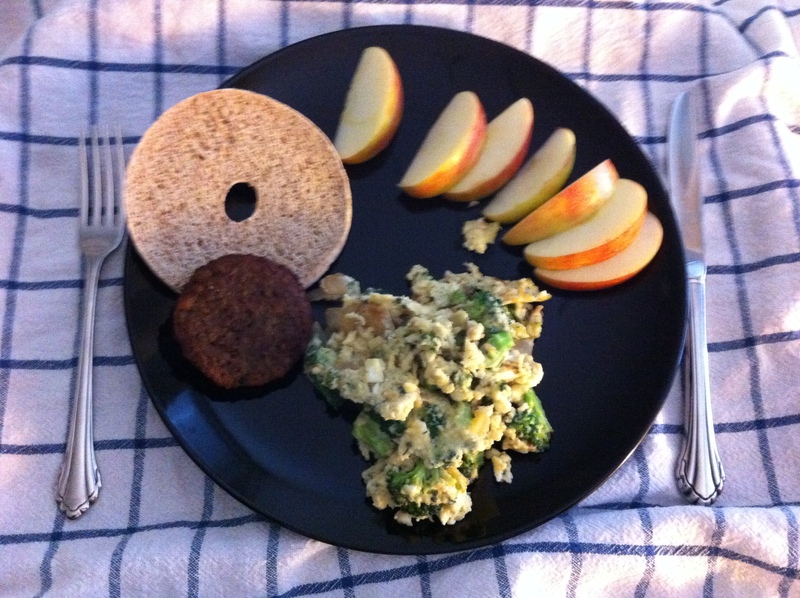 My dear husband made me scrambled eggs with onions, broccoli, and basil stirred in. He also whipped the eggs up with almond milk to make them super fluffy. Along with the eggs, I got a Morningstar sausage, half a bagel thin, and half an apple. I was as giddy as a school girl with a brand new crush! I didn’t know that he had it in him to pull of such an amazing start to the day. And he didn’t stop there! He took me to Whole Foods so I could get some alternate flours to try some new recipes (stay tuned for those!). Then I worked out while he planned a lovely lunch of spinach salad with apple and goat cheese. We snacked on crackers with more goat cheese later. My next birthday surprise was that my husband needed some time for a secret baking project. So I hung out in the basement of our building for awhile. When I came back up later, a cake was in the oven! He baked me a cake! The cake was delicious with a coconut frosting, and we shared it with friends at a surprise birthday celebration that night. I really should have taken a picture of it, but I was so excited and surprised, that I just soaked it all in instead. So close your eyes and imagine a yellow sheet cake in a glass pan covered with a white frosting with bits of toasted coconut peeking up through the surface. Jealous yet? Send this link to your loved one to inspire them for your next birthday! HAPPY BIRTHDAY MARIAN!!! Great husband work Jimmy. Love you both! Jimmy, you’re giving Eric panic attacks. I’ll have to upload the birthday cake and candles pic so you can post it here. Well done Jimmy, well done! Please do! I can update the post with his masterpiece.